3. This commercially important oxide of arsenic is the main precursor to other arsenic compounds, including organoarsenic compounds. Approximately 50,000 tonnes are produced annually. Many applications are controversial given the high toxicity of arsenic compounds. Arsenic trioxide can be generated via routine processing of arsenic compounds including the oxidation (combustion) of arsenic and arsenic-containing minerals in air. Illustrative is the roasting of orpiment, a typical arsenic sulfide ore. Most arsenic oxide is, however, obtained as a volatile by-product of the processing of other ores. For example, arsenopyrite, a common impurity in gold- and copper-containing ores, liberates arsenic trioxide upon heating in air. The processing of such minerals has led to numerous cases of poisonings. Only in China are arsenic ores intentionally mined. 3 occurs naturally as two minerals, arsenolite (cubic) and claudetite (monoclinic). Both are relatively rare secondary minerals found in oxidation zones of As-rich ore deposits. Sheets of As2O3 stand for part of structures of the recently discovered minerals lucabindiite, (K,NH4)As4O6(Cl,Br), and its sodium-analogue torrecillasite. Arsenic trioxide is an amphoteric oxide, and its aqueous solutions are weakly acidic. Thus, it dissolves readily in alkaline solutions to give arsenites. It is less soluble in acids, although it will dissolve in hydrochloric acid. In terms of its resistance to oxidation, arsenic trioxide differs from phosphorus trioxide, which readily combusts to phosphorus pentoxide. This reaction is used in the Marsh test. 3 units that share O atoms. Large scale applications include its use as a precursor to forestry products, in colorless glass production, and in electronics. 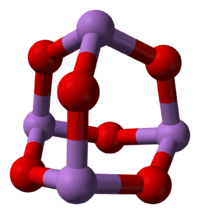 Being the main compound of arsenic, the trioxide is the precursor to elemental arsenic, arsenic alloys, and arsenide semiconductors. 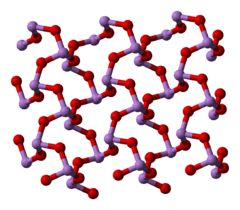 Organoarsenic compounds, e.g. feed additives (Roxarsone) and pharmaceuticals (Neosalvarsan), are derived from arsenic trioxide. 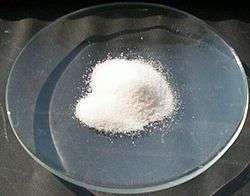 Bulk arsenic-based compounds sodium arsenite and sodium cacodylate are derived from the trioxide. A variety of applications exploit arsenic's toxicity, including the use of the oxide as a wood preservative. Copper arsenates, which are derived from arsenic trioxide, are used on a large scale as a wood preservative in the US and Malaysia, but such materials are banned in many parts of the world. This practice remains controversial. In combination with copper(II) acetate arsenic trioxide gives the vibrant pigment known as Paris green used in paints and as a rodenticide. This application has been discontinued. Despite the well known toxicity of arsenic, arsenic trioxide has long been of biomedical interest, dating to traditional Chinese medicine, where it is known as pi-shuang (Chinese: 砒霜) and is still used to treat cancer and other conditions, and to homeopathy, where it is called arsenicum album. Some discredited patent medicines, e.g., Fowler's solution, contained derivatives of arsenic oxide. In the 1970s Chinese researcher Zhang TingDong and colleagues investigated the potential use of the traditionally used Chinese medicine arsenic trioxide to treat acute promyelocytic leukemia (APL). Building on his work, research both in China and the West eventually led to the development of the drug Trisenox by PolaRx Biopharmaceuticals, Inc through NDA, which was approved for leukemia treatment by the US FDA in 2000 and subsequently marketed and sold by Cell Therapeutics, Inc., before being acquired by Cephalon. Arsenic trioxide, under the tradename Trisenox (manufacturer: Cephalon acquired by Teva), is a chemotheraputic agent approved by the US FDA for the treatment of acute promyelocytic leukemia that is unresponsive to "first line" agents, namely all-trans retinoic acid (ATRA). It has been shown that arsenic trioxide induces cancer cells to undergo apoptosis. Due to the toxic nature of arsenic, this drug carries significant risks. Use as a cytostatic in the treatment of refractory promyelocytic (M3) subtype of acute myeloid leukemia. The combination therapy of arsenic trioxide and all-trans retinoic acid (ATRA) has been approved by the U.S. Food and Drug Administration (FDA) for treatment of certain leukemias. University of Hong Kong developed a liquid form of arsenic trioxide that can be administered orally. Arsenic trioxide is readily absorbed by the digestive system: toxic effects are also well known upon inhalation or upon skin contact. Elimination is rapid at first (half-life of 1–2 days), by methylation to monomethylarsonic acid and dimethylarsonic acid, and excretion in the urine, but a certain amount (30–40% in the case of repeated exposure) is incorporated into the bones, muscles, skin, hair and nails (all tissues rich in keratin) and eliminated over a period of weeks or months. The first symptoms of acute arsenic poisoning by ingestion are digestive problems: vomiting, abdominal pains, diarrhea often accompanied by bleeding. Sub-lethal doses can lead to convulsions, cardiovascular problems, inflammation of the liver and kidneys and abnormalities in the coagulation of the blood. These are followed by the appearance of characteristic white lines (Mees' lines) on the nails and by hair loss. Lower doses lead to liver and kidney problems and to changes in the pigmentation of the skin. Even dilute solutions of arsenic trioxide are dangerous on contact with the eyes. The poisonous properties are legendary and the subject of an extensive literature. Chronic arsenic poisoning is known as arsenicosis. This disorder affects workers in smelters, in populations whose drinking water contains high levels of arsenic (0.3–0.4 ppm), and in patients treated for long periods with arsenic-based pharmaceuticals. Similarly, studies on workers exposed in copper foundries in the U.S., Japan and Sweden indicate a risk of lung cancer 6–10 times higher for the most exposed workers compared with the general population. Long-term ingestion of arsenic trioxide either in drinking water or as a medical treatment can lead to skin cancer. Reproductive problems (high incidence of miscarriage, low birth weight, congenital deformations) have also been indicated in one study of women exposed to arsenic trioxide dust as employees or neighbours of a copper foundry. In Austria, there lived the so-called "arsenic eaters of Styria", who ingested doses far beyond the lethal dose of arsenic trioxide without any apparent harm. Arsenic is thought to enable strenuous work at high altitudes, e.g. in the Alps. In the U.S., the OSHA 1910.1018 occupational permissible exposure limit for inorganic arsenic compounds in breathing zone air is 0.010 mg/m3. Smelting and related ore processing often generate arsenic trioxide, which poses a severe risks to the environment. 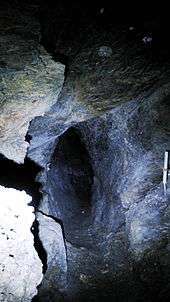 For example, the Giant Mine in Canada processed substantial amounts of arsenopyrite-contaminated gold ores. ↑ Shakhashiri, B. Z. "Chemical of the Week: Arsenic". University of Wisconsin-Madison Chemistry Dept. ↑ Patnaik, P. (2002). Handbook of Inorganic Chemicals. McGraw-Hill. ISBN 0-07-049439-8. 1 2 3 "NIOSH Pocket Guide to Chemical Hazards #0038". National Institute for Occupational Safety and Health (NIOSH). ↑ "Giant Mine – Northwest Territories Region – Indian and Northern Affairs Canada". Retrieved 2007-08-28. 1 2 3 4 Handbook of Preparative Inorganic Chemistry, 2nd Ed. Edited by G. Brauer, Academic Press, 1963, NY. ↑ Greenwood, N. N.; & Earnshaw, A. (1997). Chemistry of the Elements (2nd Edn. ), Oxford:Butterworth-Heinemann. ISBN 0-7506-3365-4. ↑ Holleman, A. F.; Wiberg, E. (2001). Inorganic Chemistry. San Diego: Academic Press. ISBN 0-12-352651-5. ↑ Gielen, M.; Tiekink, E. R. (2005). Metallotherapeutic Drugs and Metal-Based Diagnostic Agents. Wiley. p. 298. ISBN 0-470-86403-6. ↑ Gibaud, S.; Jaouen, G. (2010). "Arsenic-Based Drugs: From Fowler's Solution to Modern Anticancer Chemotherapy". Topics in Organometallic Chemistry. Topics in Organometallic Chemistry. 32: 1–20. doi:10.1007/978-3-642-13185-1_1. ISBN 978-3-642-13184-4. ↑ Rao Y, Li R, Zhang D (June 2013). "A drug from poison: how the therapeutic effect of arsenic trioxide on acute promyelocytic leukemia was discovered". Sci China Life Sci. 56 (6): 495–502. doi:10.1007/s11427-013-4487-z. PMID 23645104. ↑ Bian Z, Chen S, Cheng C, Wang J, Xiao H, Qin H (2012). "Developing new drugs from annals of Chinese medicine". Acta Pharmaceutica Sinica B. 2: 1. doi:10.1016/j.apsb.2011.12.007. ↑ Soignet, S. L.; Frankel, S. R.; Douer, D.; Tallman, M. S.; Kantarjian, H.; Calleja, E.; Stone, R. M.; Kalaycio, M.; Scheinberg, D. A.; et al. (2001). "United States Multicenter Study of Arsenic Trioxide in Relapsed Acute Promyelocytic Leukemia" (pdf). Journal of Clinical Oncology. 19 (18): 3852–3860. PMID 11559723. ↑ Antman, K. H. (2001). "Introduction: The history of arsenic trioxide in cancer therapy" (pdf). Oncologist. 6 (Supplement 2): 1–2. doi:10.1634/theoncologist.6-suppl_2-1. PMID 11331433. ↑ Zhu, J.; Chen, Z.; Lallemand-Breitenbach, V.; De Thé, H. (2002). "How acute promyelocytic leukaemia revived arsenic". Nature Reviews Cancer. 2 (9): 705–714. doi:10.1038/nrc887. PMID 12209159. ↑ Au, W.-Y. ; Kumana, C. R.; Kou, M.; Mak, R.; Chan, G. C.; Lam, C.-W.; Kwong, Y.-L. (2003). "Oral arsenic trioxide in the treatment of relapsed acute promyelocytic leukemia" (pdf). Blood. 102 (1): 407–408. doi:10.1182/blood-2003-01-0298. PMID 12814916. ↑ "Stanton v Benzler 9716830". U.S. 9th Circuit Court of Appeals. 1998-06-17. Retrieved 2008-06-09. (...) convicted by a jury of first degree murder for poisoning her ex-husband. Her ex-husband's body was found with traces of arsenic trioxide in it. ↑ Emsley, J. (2006). "Arsenic". The Elements of Murder: A History of Poison. Oxford University Press. pp. 93–197. ISBN 978-0-19-280600-0. ↑ Flaubert, G. (1856). Madame Bovary. ↑ "Arsenic Eaters". New York Times. July 26, 1885. ↑ Allesch, R. M. (1959). Arsenik. Seine Geschichte in Österreich. Archiv für vaterländische Geschichte und Topographie. 54. Klagenfurt: Kleinmayr. ↑ Przygoda, G.; Feldmann, J.; Cullen, W. R. (2001). "The arsenic eaters of Styria: a different picture of people who were chronically exposed to arsenic". Applied Organometallic Chemistry. 15 (6): 457–462. doi:10.1002/aoc.126. ↑ Whorton, J. C. (2010). The Arsenic Century. Oxford University Press. pp. 270–273. ISBN 978-0-19-960599-6. "Arsenic and Arsenic Compounds". Summaries & Evaluations. International Agency for Research on Cancer (IARC). February 1998. The use of Arsenic trioxide in medicine.